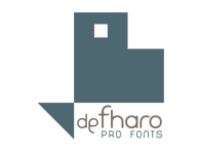 My name is Fernando Haro, I am a freelance graphic designer and live in Spain. I always liked the purity and expressiveness of vector design, discovering typography design involuntarily found a passion. In the way of learning, I have developed different font styles, so therefore my work is eclectic. I am technically very interested in open type functions, minimalism in vector drawing and definition of kerning.